Today is Sunday, which means it’s Sunday Long Run. Those of you that are runners know what I mean. I moved to London last Saturday and my goal for my runs is to use them as a way to explore new places. Yesterday, I went to see Leeds United play with a friend from Atlanta who grew up a Leeds fan. Today, I set out to see some football stadiums. I mapped a route that took me from Wimbledon, past three iconic football stadiums. Shortly after I posted my run on Instagram, someone commented that I had missed a nearby stadium. Naturally I thought I needed a viz to keep track of the stadiums I have visited. I found the geocodes for more stadiums here, but it was missing a few teams. I created this csv to track the stadiums where I’ve seen games. I’m going to do my best to keep up with it. This viz includes the first four divisions in both English and Scottish football (as of the 2014-15 season). 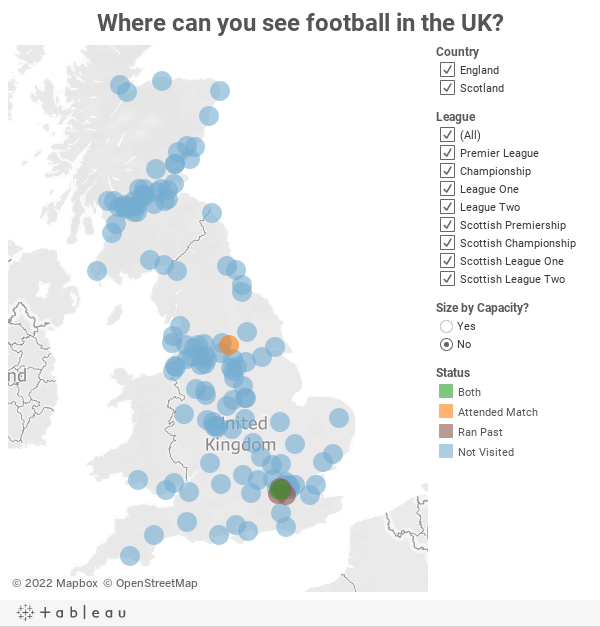 And yes, I know I titled this post "English" and Scotland is not part of England, but UK football stadium tracker doesn't resonate as well with me.